Well, this book was heavy. The kind of book that punches you in the gut and leaves you stumbling around for days thinking about the pain it brought you. Don’t get me wrong, it was a gorgeous book that was beautifully written with amazing main characters. But the subject matter is hard. It is real though and needs to be told. Mental health issues are a reality and people who have them often run into misunderstanding and are stigmatized. This book could really help spread awareness on that. 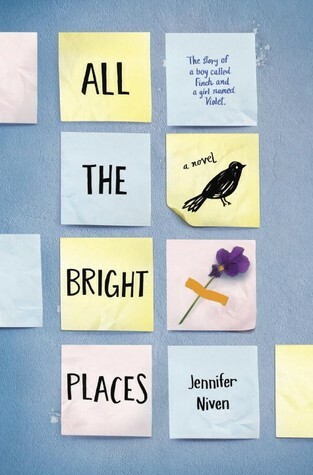 Violet and Finch are two great characters and while they are indeed very quirky and intelligent for their age and may remind you of John Green characters, they still have their own distinct personalities. I loved their journey together, both their emotional journey and their wanderings (I’ve come to realize I really love the roadtrip or travel aspects in contemporaries). I liked that we got chapters in each of their POV as they both had such different issues and journeys and I like that even though it was hard, there was still some lightheartedness in there as well. I can see why it’s such a top-rated book as it is gorgeous, heart-wrenching and thought-provoking. But for now I just need to process this one some more and maybe go watch some light fluffy comedies.